World Markets (EEM) could be bottoming after 27% drop. 01/27/2019: Markets were mixed for the week after bouncing up from a sell off earlier. So far the DOW Index has bounced up 3160 points without much of a pull back and the FEAR is gone. That will probably indicate that some profit taking will come in soon. We like to Buy when the Herd is Selling, and now the Herd seems to be Buying again after a 12%+ pop off the lows. The World Markets could be bottoming after a one year decline of 27%. Maybe the US Dollar is topping out. Investor Sentiment has turned much more positive according to the FEAR Index. For the week the Dow was up 0.12%, the S&P 500 was down 0.26%, and the Nasdaq 100 was up 0.04%. The very Long Term Trend on the Stock Markets is UP. The DOW Index and the NASDAQ 100 are the major US Indices that closed Above the Green Lines. The Inflation Index (CRB) was down 0.84% and is Below the Green Line, indicating Economic Weakness. Bonds were down 0.81% for the week and are Above the Green Line, indicating Economic Weakness. The US DOLLAR was down 0.47%, and the Relative Strength is now dropping. Crude Oil was down 0.65% for the week at $53.69, and GOLD was up 1.21% at $1298. We are currently in 6 logged Open Positions, for the Short & Medium Term. There are 3 Investments on the Short Term Watch List. ARWR ARROWHEAD PHARMA. Buy if it Closes above $15.47. 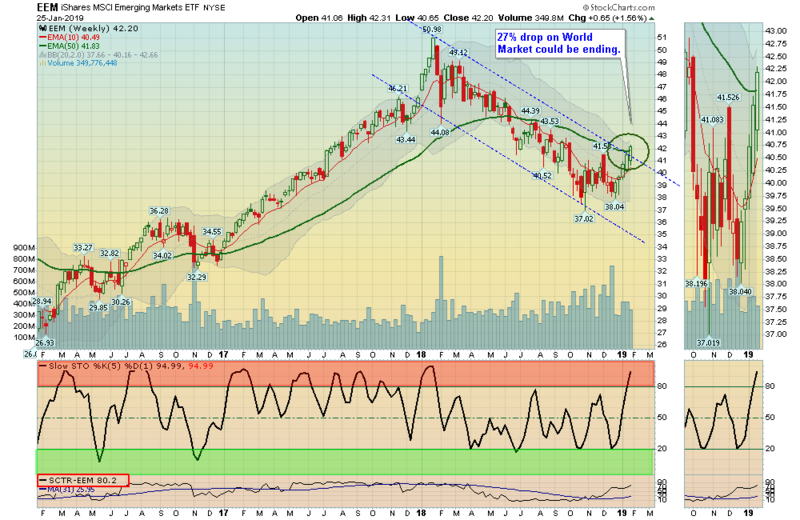 FTNT FORTINET INC. Buy if it Closes above $75.29. GME GAME STOP CORP. Buy if it Closes above $16.90. I INTELSAT GLOBAL Buy if it Closes above $24.28. Alert! Market Risk is MEDIUM HIGH (Orange Zone). The probability of successful Short Term Trades is better, when the S&P 500 is down near the Green Line. Emailed to your box between 3:30 3:50pm EST. Text messages: Email us your Cell number & phone carrier.